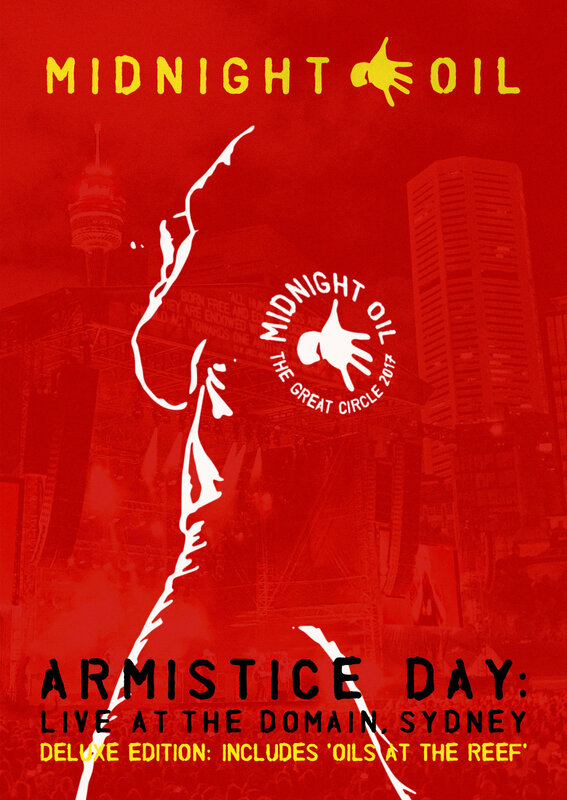 Head to www.midnightoil.com/store to pre-order ‘Armistice Day: Live From The Domain Sydney’ album, DVD and Blu-Ray out Nov 9. 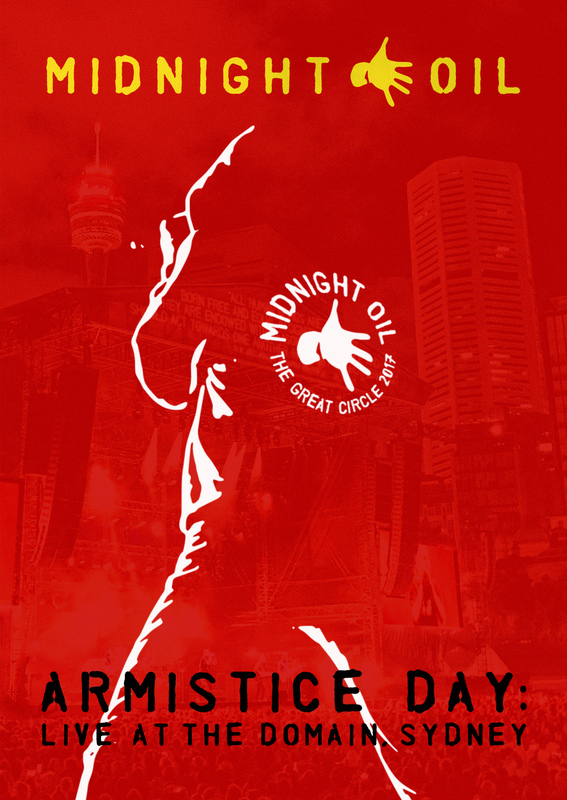 In February 2017, Midnight Oil took to Sydney Harbour and announced The Great Circle World Tour. The Circle would begin where the band started out, in Sydney’s pubs, then circumnavigate the globe. It was to be their first tour in over 15 years. Over the next six months, Midnight Oil played in 16 countries, across five continents, speaking out for a healthy planet, and social justice along the way. Eventually, they returned to circle around Australia, the land that shaped the Oils and their music. They started with some homecoming gigs in the outback, before hitting the tropical north, where they campaigned against nearby coal mines that would further endanger the world’s largest living organism, the Great Barrier Reef. From there the tour braved some torrential downpours as it headed south, down the coast. It then rolled across the country where this band first cut their teeth, rekindling old memories and creating new ones with every show. From the vineyards of the Hunter Valley, to the mighty Murray River, and the shadow of Hanging Rock, then on to the big smoke. Canberra, Adelaide, Perth, Hobart and Melbourne’s Myer Music Bowl where guitarist Jim Moginie tore his hamstring from the bone and was forced into a wheelchair for the last four gigs. Finally this epic tour circled back to the city where it all began. The venue? Sydney’s Domain; a place that encapsulates a nation’s history. For thousands of years it was a ceremonial site for the local Gadigal people. In 1788 English forces landed nearby and turned this land into the Governor’s personal playground. In the 20th century the Domain became known as the home of soapbox oratory and political rallies. From the Great Depression to the Vietnam War this is the place where people came together to debate the issues that shaped modern Australia. The show itself even became a political flashpoint with former Prime Minister, Paul Keating making headlines when he called Midnight Oil “squatters” for staging these concerts in a public park. The band borrowed a famous Keating line for their retort: “Paul, these are the gigs Sydney had to have”. And so, after 77 performances to over a half million people around the world, this is where The Great Circle Tour would finally come to a close. Two hometown shows in this special place. The first date? November 11. Known to some as Armistice Day. Now, 12 months later, fans around Australia and across the world can get to see, hear and feel what it was like to be there as Midnight Oil lit up their hometown for two unforgettable nights at the climax of The Great Circle 2017 World Tour. Available for pre order from today, ARMISTICE DAY: LIVE AT THE DOMAIN, SYDNEY will be released globally through Sony Music Entertainment Australia on Friday November 9th. It will be available on DVD and Blu-Ray (both region 0) as well as CD, downloads and streaming. All tracks were mixed by Kevin ‘Caveman’ Shirley and mastered by Bob Ludwig. 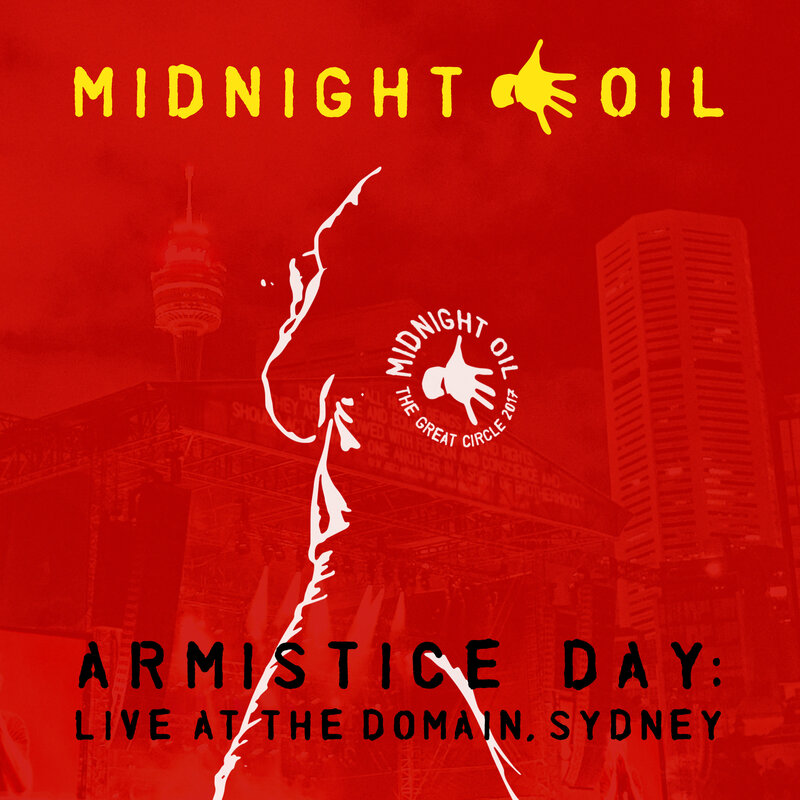 ARMISTICE DAY: LIVE AT THE DOMAIN, SYDNEY showcases Midnight Oil at their absolute finest, playing iconic hits such as ‘Redneck Wonderland’, ‘US Forces’, ‘Beds Are Burning’, ‘Forgotten Years’, ‘Don’t Wanna Be The One’, ‘Truganini’ and ‘Power And The Passion’. The forthcoming release also features an incendiary version of Yothu Yindi’s 1991 hit ‘Treaty’ (co-written by Peter Garrett) that is available today. Guesting on the track is acclaimed vocalist Yirrmal Marika from North-East Arnhem Land, who is the Grandson of Yothu Yindi’s original lead singer. This Australian classic was initially inspired by former Prime Minister Bob Hawke’s 1988 promise of a treaty with First Nations’ People – a promise that remains unkept three decades later and helped lead to last year’s “Uluru Statement From The Heart”. The DVD & Blu-Ray feature two exclusive bonus performances (‘No Time For Games’ and ‘Only The Strong’) while the album includes three extra songs (‘Ships Of Freedom’, ‘Dreamworld’ and ‘Golden Age’) that were not featured in the Domain sets so these tracks were captured at the Sidney Myer Music Bowl in Melbourne a few days earlier. Australia will also release a special Deluxe CD/DVD edition. This collector’s package includes a bonus 75 minute film called ‘Oils at the Reef’. Originally created by Foxtel’s “MAX” channel it features band interviews plus an intimate, stripped back benefit gig at the Tanks Arts Centre in Cairns on October 6 2017 to help create awareness of the threats facing the Great Barrier Reef. All funds raised from the benefit were donated directly to Great Barrier Reef Legacy and the Australian Marine Conservation Society.